Boardinghouse Heidelberg | Luise5 Apartements next to the ATOS Clinic Heidelberg. When staying with us, you can enjoy the additional comfort, privacy and independence that our apartments have to offer, giving you the luxury of doing whatever you please, whenever you please. Soak up the special atmosphere of the spacious rooms in the historic Jugendstil building – one of Heidelberg’s cultural monuments – which are stylishly furnished to the highest standards. Whether you are planning a family holiday, a business trip or a long-term stay in Heidelberg, our boarding house gives you ample room to spread your wings – for three nights, a week or longer. 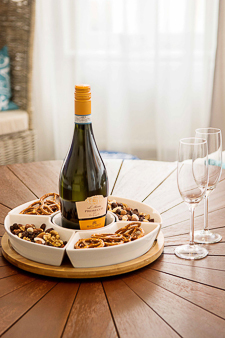 We offer attractive conditions to long-term guests (minimum stays of 4 weeks). 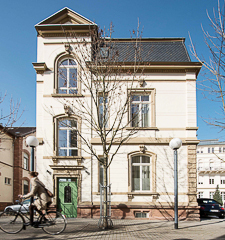 Luise 5 – your home away from home – is located in the heart of Heidelberg, just 100 m away from the central Bismarckplatz square and from Heidelberg’s Hauptstraße, Europe’s longest and most attractive pedestrian zone. As the Bismarckplatz is Heidelberg’s main transport hub, you can travel around easily from here using public transport. Your accommodation is in the building next to the ATOS Clinic Heidelberg. This is an extremely quiet and peaceful residential area. You don’t hear any street noise and yet you are in the heart of the city. This really is a very special location – you simply have to see it for yourself. Shops and restaurants as well as the historic old town are within easy walking distance. There are also metered parking spaces directly at the house. The P14 underground car park for the ATOS Clinic Heidelberg is nearby and there is another underground car park just around the corner. Your two-room apartment features a cosily-furnished bedroom with a large wardrobe. It also has a separate living area with an extremely comfortable sofa bed and a fully-equipped kitchen that has everything you could possibly need. A separate space for working and a cosy dining area, not to mention the bright and cheerful bathroom with shower, make your stay complete. Other facilities include high-speed wireless LAN and two cable TVs. If you need to do any laundry during your stay, you can use the washing machine and tumble dryer in the basement. Our spacious two-room apartments for 1-4 persons provide you with 50 m² of stylish comfort. Luise5 offers a total of six equally-sized apartments. Please note – this is a non-smoking establishment – thank you! There’s plenty of shopping nearby, ranging from supermarkets, to bakeries, to good restaurants and fast food outlets. Would you like to book an apartment with us?